Home - Maglogix: Magnetism Redefined! Introducing the MAGLOGIX® Manhole Lifting System! Our lifting system helps eliminate common employee injuries such as shoulder and back injuries, and torn rotator cuffs. If a casting is free and able to be lifted, the Maglogix® Manhole Lifting System makes removal and replacement faster, safer, and easier. You’ll work with more efficiency and less effort due to the easy on/off of the magnet and rapid attachment to the dolly. For product questions or sales inquiries, please contact Ted Brooks at 303-885-6400. Now available: The new MAGLOGIX® MagnaHoist® MXL-2200 lbs, one metric ton lifter! The One Ton Lifter is the reason we say, “No Other Magnet Even Comes Close!” The lightest on the market at under 40 lbs, with an incredible 7500 lbs. of holding force starting at ½” thick steel, this magnet offers 2200 lbs of Safe Working Load starting on 3/8” steel! With mounting holes on the top and front, the One Ton is designed to be used for a wide variety of lifting and fabricating needs. MAGLOGIX® focuses on the development of switchable magnetic products for industries that need the ability to attach and detach devices to ferrous metal surfaces quickly and securely.
. . . generate a very compact magnetic field that develops superior adhesive force, particularly on thin materials from 2mm to 12mm (.080″ to 1/2″) thick. While our new magnetic technology provides incredible thin metal adhesion, it also provides superior performance on thicker metals. MAGLOGIX® award winning technology provides far superior holding power, weighs less, and has a much smaller footprint compared to other switchable magnet technology. Perhaps best of all, it requires no power to operate, making it the obvious choice for attaching devices to ferrous metal surfaces quickly and securely, even in remote areas where no power is available. Simply put, MAGLOGIX® switchable magnets not only outperform all other switchable magnets, but also most electro magnets! 2.5 – MAGLOGIX® has a magnet that is only 2.5″ in diameter, less than 1″ tall yet has a breakaway strength of over 800 lbs on 3/8″ thick steel and over 750 lbs on 1/4″. 3 – MAGLOGIX® magnets are typically 3 times smaller than similarly rated magnets. 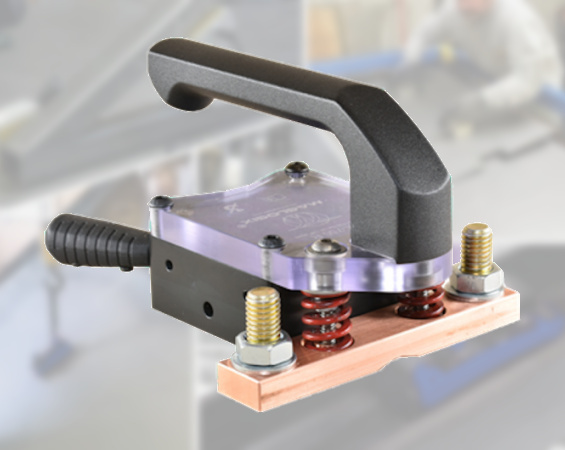 4 – A MAGLOGIX® 4 lb magnet grips with 1600 lbs of force on steel that is only 3/8″ thick. Our competition need a 122 lb magnet and a minimum of 1/2″ thick steel to do the same adhesion. 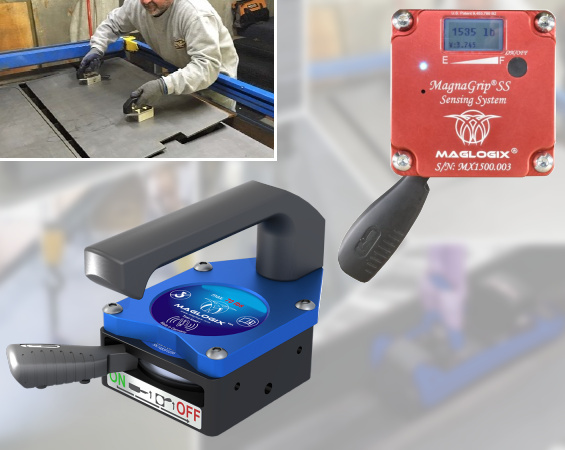 10 – MAGLOGIX® magnets typically lift up to 10 times more weight than larger lifting magnets and electromagnets when tested on material of a type and thickness for which it would commonly be used. 150 – Typical magnets are able to grip with up to 55 psi. MAGLOGIX® magnets can achieve over 150 psi and do so on thinner, more commonly used, steel plate. This results in greater shear force (sliding) performance as well. 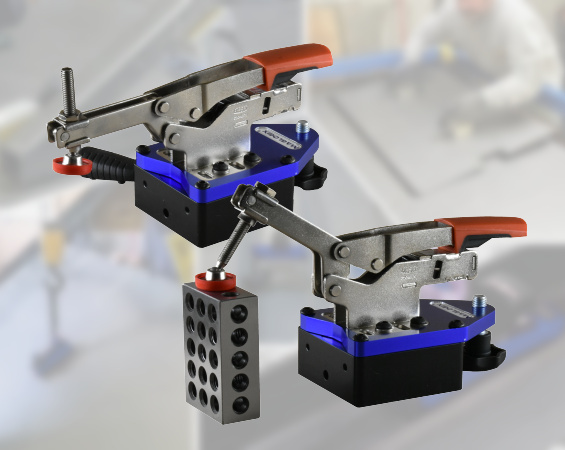 500 – MAGLOGIX® has magnet models that can hold in excess of 500 times their own weight, which is a power to weight ratio never before seen in lifting magnets. Many competitive magnets cannot manage better than 100:1, and most cannot manage better than 20:1 on the most commonly lifted thickness of steel plate (1/4-1/2”). 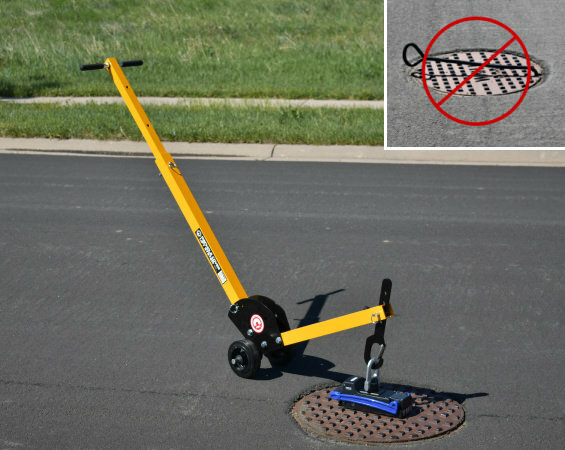 MAGLOGIX® Manhole Lifting System Helps eliminate common employee injuries while making manhole cover removal and replacement faster, safer, and easier. MagnaDrill® Light weight, no power necessary. Quickly, conveniently, and securely attach any power drill to ferrous metal surfaces. 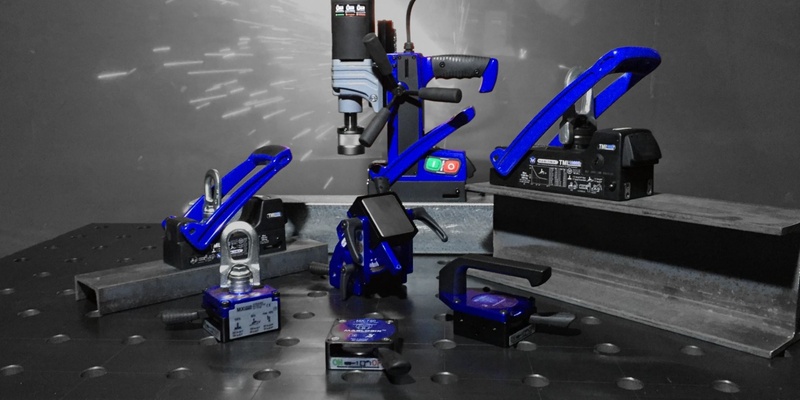 Allows for easier, faster, more accurate drilling while helping to prevent user fatigue and injuries. For more information or for sales inquiries, please contact Ted Brooks at 303-885-6400.